War and social unrest historically originate from an unstable and faltering economy. To create stability in a region we must shy away from military tactics and instead focus on fostering job creation, innovation and entrepreneurship. Back in 2010 President Obama pledged $445 million to fund start ups in the Middle East. In war torn countries like Afghanistan much of the potential workforce is made up of women who are likely to be widowed and are likely to be single mothers. As US forces slowly exit Afghanistan it is imperative that their immediately be developing industry and jobs for these women in order to create and maintain long term stability. I truly believe that our efforts and money would be better vested in funding women lead entrepreneurial ventures, instead of solving our problems in the Middle East with military tactics. 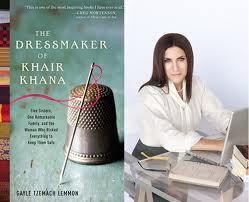 The book, “The Dressmaker of Khair Khana” by Gayle Tzemach Lemmon is a micro case of successful female fashion entrepreneurship during the height of war in Afghanistan. The novel relays the true story of Kamila Sidiqi, an Afghani woman who managed to successfully operate a female owned and operated dress making business. Even under the cloak of secrecy, a lack of tools, and the tolls of war these women were able to make a profit, develop skills and support their families. Imagine what these women could accomplish if they were provided a safe environment and the necessary tools! I think that it is up to the American fashion community, especially women in fashion, to explore funding and running operations out of the Middle East. Our reliance on China as an industry is a bit frightening, can be questionably ethical, and products from China are not always of the highest quality, or highly regarded. Middle Eastern women are skilled in traditional craft skills, like embroidery and beading, and there are many organizations currently in the Middle East helping these women to hone these skills. I propose that the fashion industry, in conjunction with the UN and the US government, investigate creating safe communities where women can live and work (similar to the Starbucks model in Africa) while creating quality products in the Middle East. Cost of production in the Middle East would be comparable to that of China, quality would be better, shipping costs would be less and western women would be more open to purchasing ethically made products produced by other women. In July Vogue Italy’s editor in chief Franca Sozzani was named the UN’s new good will ambassador. Sozzani’s first order of business is, “‘Fashion 4 Development’, a new United Nations initiative which aims to encourage fashion leaders to work on sustainable development schemes. The two-year platform forms part of the organization’s ‘Millennium Development Goals’ and aims to “increase economic levels, decrease poverty and hunger, and help empower women in these countries”(WWD 06/22/2012). I hope that funding female fashion entrepreneurship in the Middle East is at the top of the agenda. Fashion is one of the top global industries, it is up to those in the industry to stop exploiting the global community and start giving back while promoting sustainable and ethical development. Fashion can bring about autonomy for women around the globe! Afghanistan. Africa. Amanda Curtis. Book. Fashion. Franca Sozzani. Freedom. Gayle Tzemach. gayle tzemach lemmon. Kamila Sidiqui. Lebanon. Production. Starbucks. The Dressmaker of Khair Khana. Uncategorized. vogue. women's rights. WWD.